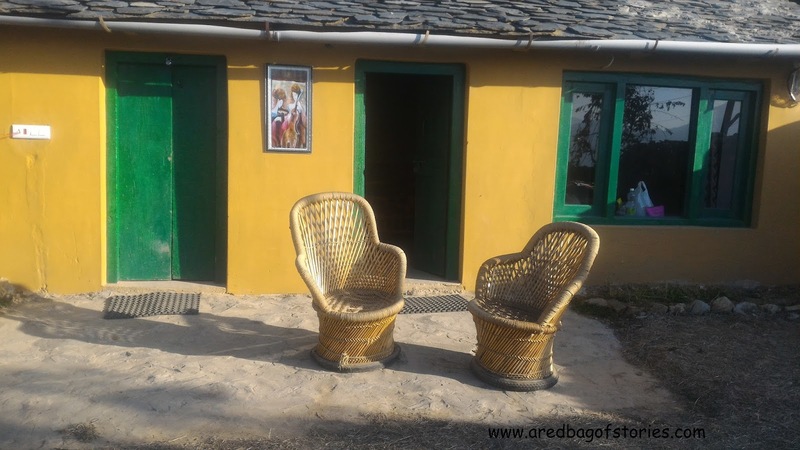 My good friend, fellow traveller and travel blogger, Akanksha and I had been invited to visit Pahadi House Kanatal a while back. It was a very instant plan and she managed a rare feat of booking tatkal tickets for an overnight train to Haridwar for Friday night. We reached Haridwar around 5 starving. There were quite a few shops open on the station road making hot samosas, pakodas, paranthas and tea. People, mostly coming out of the station, were starting to gather around one or two shops every once in a while. 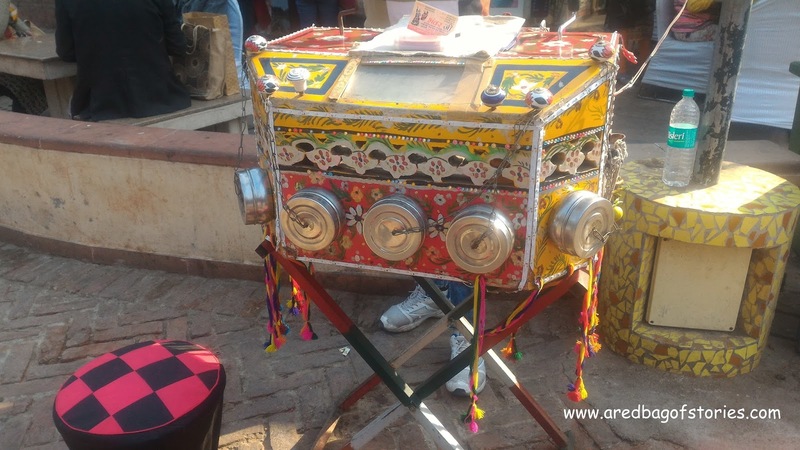 We too parked ourselves in front of one and gulped down two aloo paranthas and bread pakoras. Then we had to decide on how to reach Rishikesh as that's where the Pahadi House guy was to pick us up for the onward journey. We got in to one of those shared autos for a ride to Rishikesh with no one else sharing the auto. 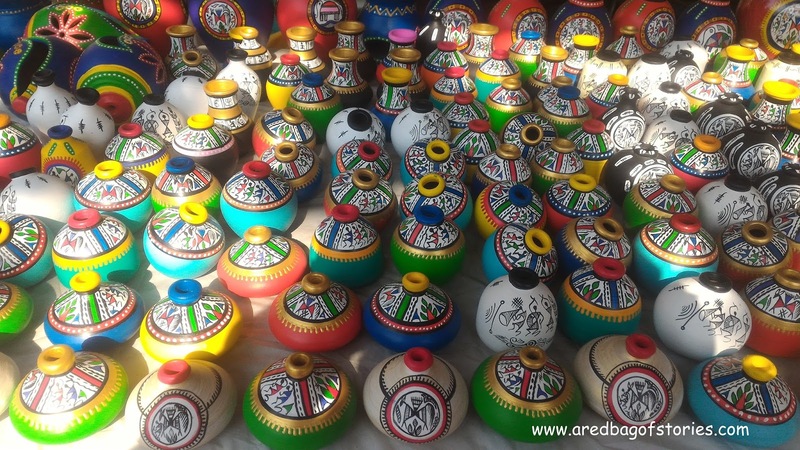 It was quoted 500 rupees initially but we got it down to 300. A few meters later he asked us to move to another auto which already had 2 passsengers. 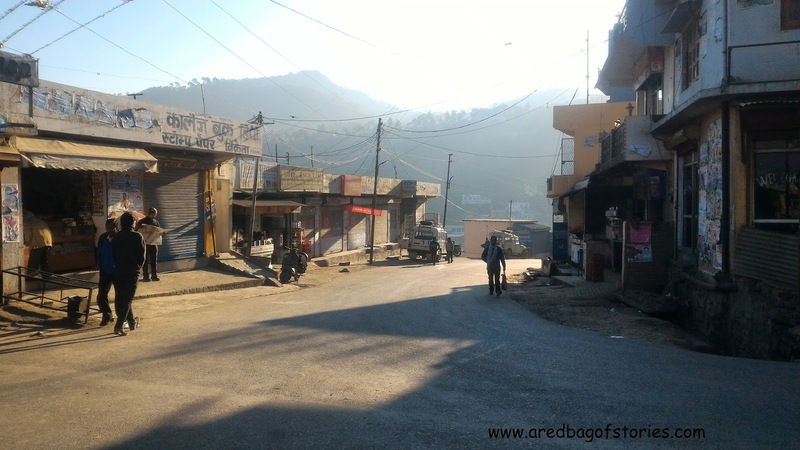 We shelved the plan and moved back towards the bus stand to take a bus to Rishikesh. Just outside the bus terminal was the prepaid taxi booth that was open. 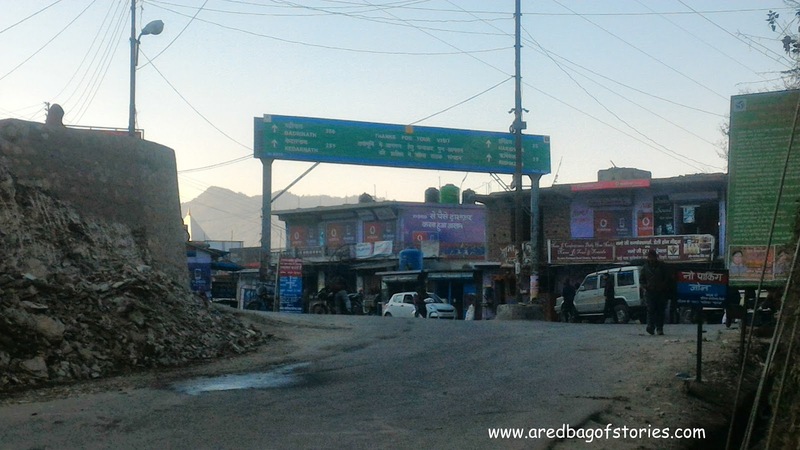 On checking the prices and that it would cost us just the same for a to & fro journey as we would have paid the Pahadi House for a pick up, we decided to take it and save the trouble to get another vehicle till Rishikesh and all that. So at 4k and a driver who seemed quite honest, we started the trip from Haridwar in no less than a royal Ambassador. And we were in Kanatal in about two and a half hours. 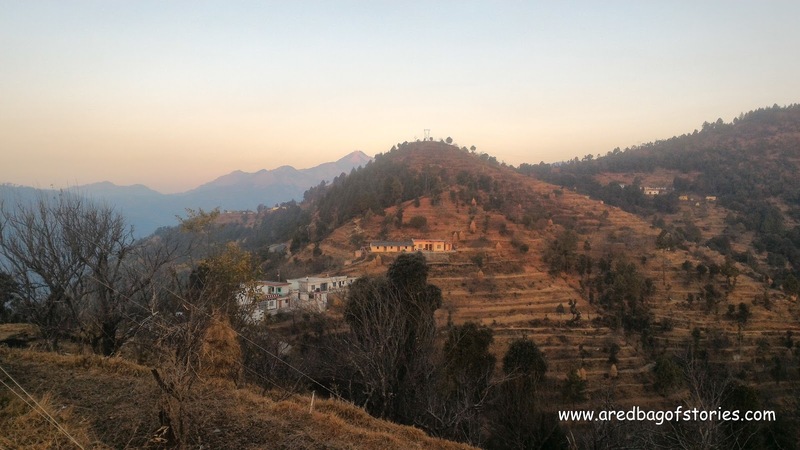 The most convenient way to reach Kanatal is to take an overnight train to Haridwar, get out of the station, go straight to the prepaid booth and get a taxi for a return journey. For return, take a UP Tourism Volvo from Rishikesh. Easy. No plush marble floors, or rugs or bathtubs or intercom for room service. There were just 3 cottages made of mud (yes!) and furnished with in keeping with the aesthetics. There were no fancy balconies, instead the cottage opened right towards facing the mountains and village houses. 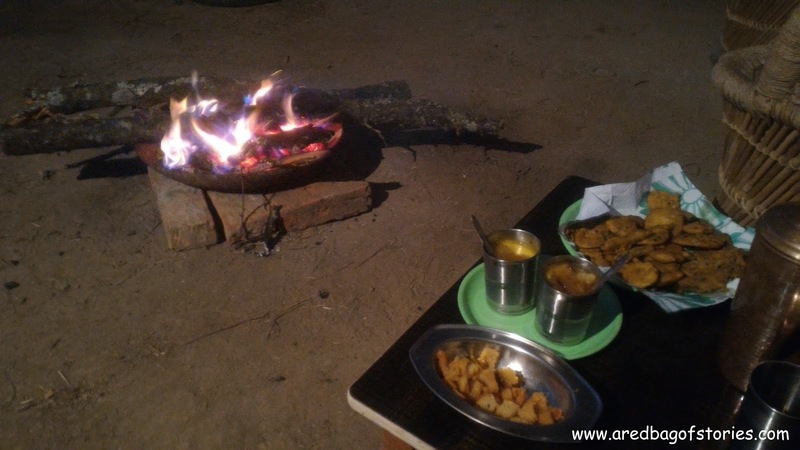 The hot water we got was heated on a wooden chulha and the food was also made on that mostly. The utensils were made of brass, no tv or wifi (thank God for that) and all you had to do to engage yourself was to sit on those chairs close to the cliff and watch the time stop or put on your shoes and go for a walk. I mostly chose the former (can you blame me??!!). 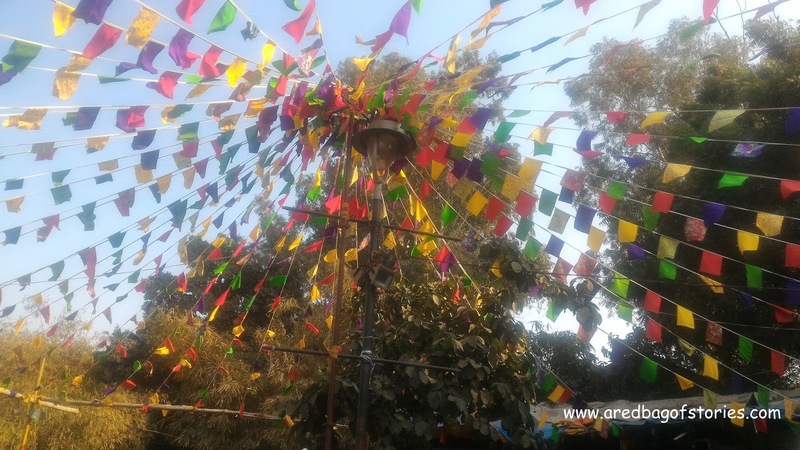 Just saying that there was this pitch silence and a perfect quietude around Pahadi House at any given time of day may look nothing extraordinary but I would tell you how. I woke up around 7 in the morning and was sitting out, sipping my honey-ginger-lemon tea. Far across the hill, there was a cluster of houses and on the porch of one of those was a little girl skipping rope. At that time, all I could hear was the sound of her footsteps, skipping, tip-tapping one foot at a time on the floor. Around 10 in the morning, we were sitting having breakfast and the only sound to be heard except us munching and chewing the food was chirping birds. It really felt like one of those tunes for inducing sleep. With my sleep-heavy eyes nicely covered with sunglasses, I was soaking the sun late afternoon. And I could hear a bee buzzing around me. Like its every single buzz could be heard and deciphered. In between all the long spells of silence, we could hear a vehicle or two passing by the main Mussoorie highway. 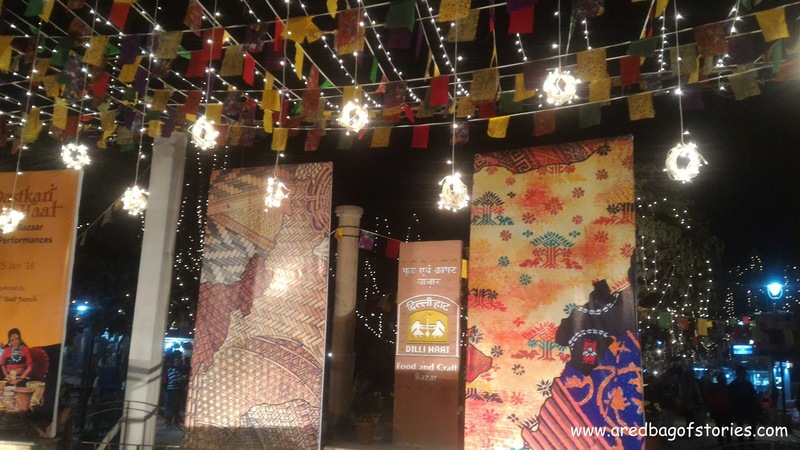 Far somewhere we could also hear some Garhwali music playing while we were having dinner. All these soundbites that we never pay attention too, made their presence felt in such a way that it was hard to ignore them. You could just close your eyes and be in the moment. 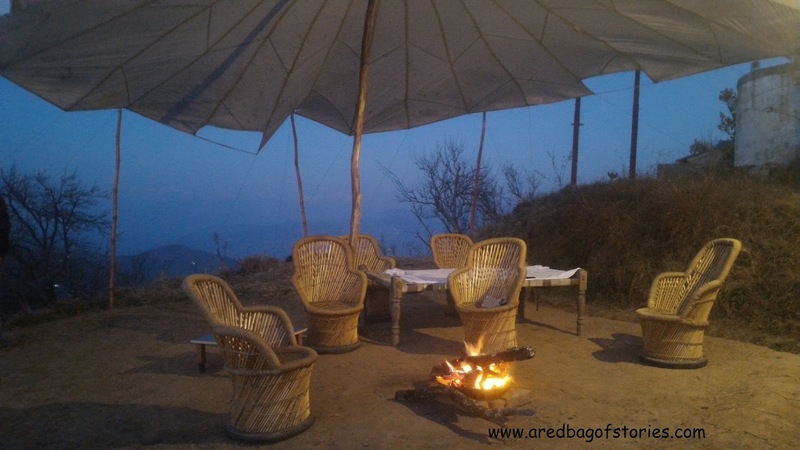 During winters in the mountains, most of everyday life and such things come to revolve around the bonfire that people make to keep them warm. Sitting around the fire becomes the way of life and a great way to exchange information about the village, talk about the respective families and bonding over common connections from the same village. Talking about Uttarakhand is a good bonfire conversation starter. So we discovered. As soon as the last few rays of sun melted away, the very efficient and friendly people of Pahadi House lit up some fire and we moved our chairs around it. We were also quickly served hot tomato soup with dollops of butter and hot, hot pakode. And then started chitchat with one of the guys from Pahadi House who hails from Rishikesh. We were soon joined by the very talented chef in-charge, Semwal ji who though lives in Rishikesh but belongs to Tehri. And soon joined in Negi ji, our driver who had driven us from Haridwar. The conversation ranged from the honesty of Uttarakhand CM to the corrupt previous governments, from wipeout of 2013 Uttarakhand flood to stories about miraculous escape from the flood, from religious tolerance in the state to ruckus that outsiders cause. Semwal ji regaled us with his work experiences from Kuwait to Iraq. He is 61 but is fitter and agile than people younger to him. I am not sure there is anything that he can't cook (and I mean both, food and conversations!). Devesh, Pahadi House all-rounder, through his vast knowledge about the treks and love for travel, shared his stories about the places and people, and that he too was interested in yoga like me. All of them, whatever their profession be, seem to know almost every single thing about their state and their love for it was common. Not even once, like most of us, did they crib about what it lacks or what do big cities have. These two hours must have been most intelligent two hours we had spent in a long long time. By the time we wrapped up the discussion and got ready for dinner, there was a pitch darkness all around, with sporadic lights in cluster of houses every few miles deep in the valley could be seen. And the sky was full of stars that you only get to see up high in the mountains. Semwal ji's culinary prowess can be only experienced in the delicious meals that he makes with so much love. The first meal that we were served was thick, hot aloo parantha and believe me I have never had aloo parantha like that, ever. And it is big knowing I am a Punjabi and parantha is our national food! Aloo parantha with curd and pickle and with this fit-for-a-king like breakfast, we were quite looking forward to the rest of our stay. And we were not disappointed. In fact, the food just got better with every meal. It felt like we had gone there just to eat. When I had had 3 of those paranthas, I was so full that I knew I couldn't eat anything for next few hours. Well, lunch was served around 2 and we were already starving! Fresh mix vegetables, gehat ki daal (a local lentil grown and eaten in Uttarakhand), coarse pudina chutney grounded on mortel pestle, vegetable raita, kachumbar salad, steamed rice and fluffy, pillowy soft rotis. I am not even going to mention the count of rotis I ate. I lost the count midway myself! An evening around bonfire with potato, green chillis and mustard greens pakodas with a bowl of tomato-carrot soup topped with butter, with fresh croutons on the side just set the tummy for dinner. Arhar daal, kadhai paneer, rotis and hot kheer and sleep was already close by. 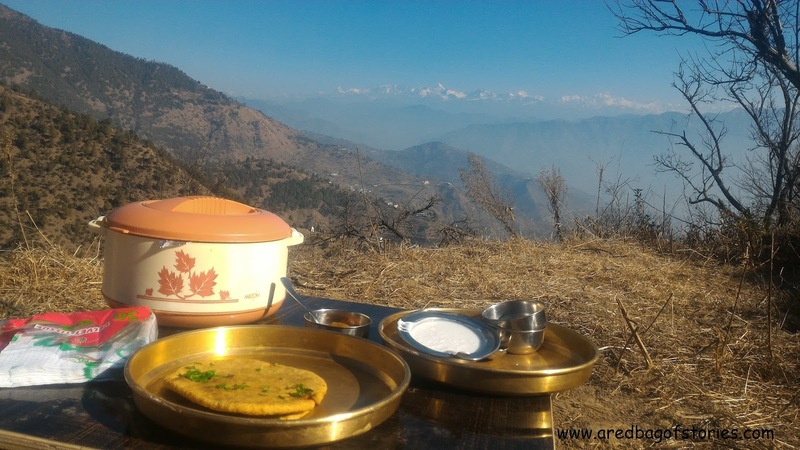 We woke up to a bright, sunny morning and Semwal ji was ready with his breakfast spread of parantha stuffed with mustard greens, aloo ke gutke (dry aloo subzi), dahi and pickle. The mustard green paranthas were something new for us and were really soft and not too oily too (if you were watching weight, still!). All the meals were made from local produce, seasonal vegetables, freshly prepared with simple ingredients. 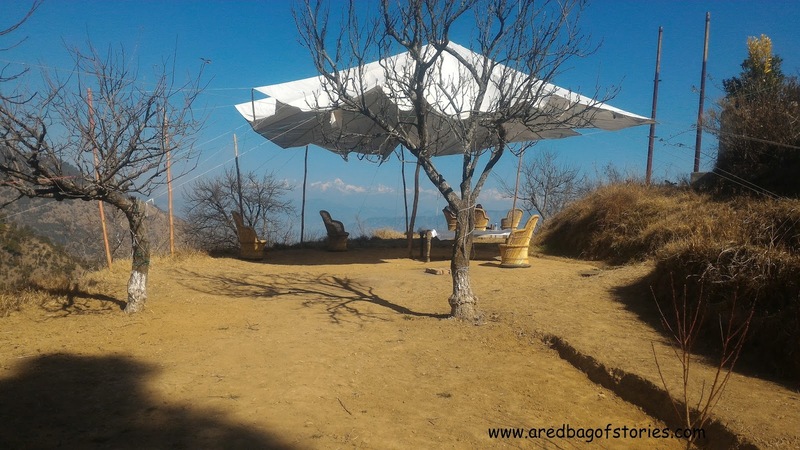 But up in the hills, with cold January wind blowing, those meals kept us warm and tasted straight out of a Michelin star kitchen. If I would go back, my motivation would be to go back for those hearty meals that Semwal ji made for us with a smile. Wake up to watch sunrise. Or do something even better. I love making an effort to get up and watch sunrises whenever I am travelling. There is something magical in sunrises in the hills. Devesh had already knocked at the door to wake us up around half past six but we were blissfully comfortable in the la-la land. A while later I did manage to get out of the quilt, put on some extra layers, cap and gloves, took my camera, notepad and marched out of the heater-cozy room. I made my way up where I could get a clear view of the rising sun. And there it was. Orange-crimson hued sun making its way from behind the mountains. The houses nearby, the valley down everything was enveloped in the orange-pink hues of early morning sun. It was hard not to feast your eyes on the view and let it all hypnotize you. Some twenty minutes and clicking some pictures later, I went up to where the kitchen is. 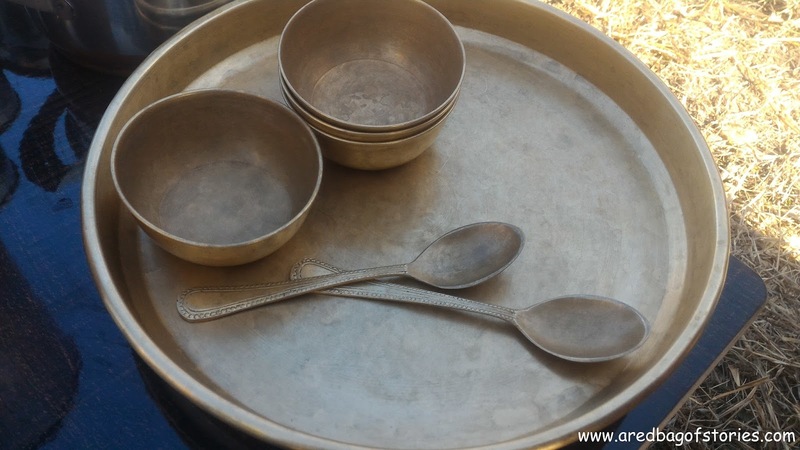 All the four guys (Semwal ji, Devesh, Negi ji and dada, the caretaker of the property) were sitting around a wooden chulha, with a huge vessel on top of it with water being boiled for bath. I sat there on one of the little stools around the fire, and was quickly served a hot, honey-ginger-lemon tea. With my fingers wrapped around the mug, I just got swept in their conversations. This time too it was about Uttarakhand, the religious places around, about their families, about my yoga interests and it was past 9 when we realized that water on the chulha was hot enough for bathing. And that's how the meeting got adjourned! I had woken up with the intention to watch the sunrise, sip coffee, write a bit and maybe, get back to sleep for half an hour. But I think I did much much better than that. And I did mention that I caught that little girl skipping rope and her footsteps cutting through the morning silence from across the hill. 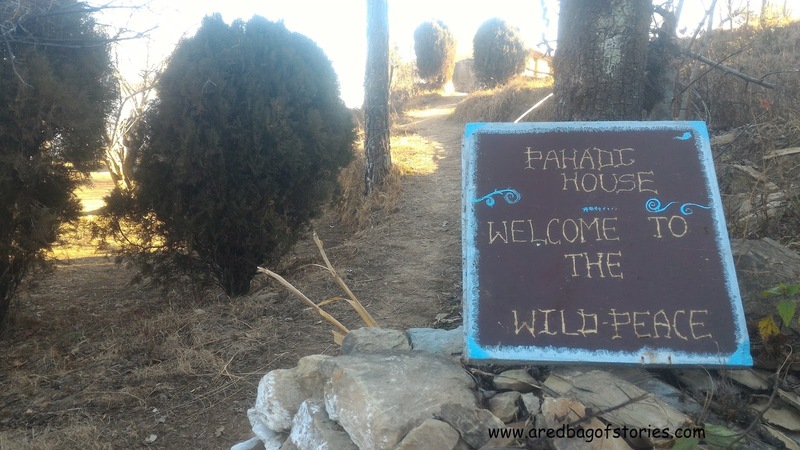 Though I was too lazy and apprehensive to venture out (because of motion sickness) but there are lot of interesting places to be explored around Pahadi House that Devesh would be happy to guide you to. There is Kodia forest about 10 kilometers away where you see large pine trees and hear birds, and my friend clicked some gorgeous pictures there. You could go for walk in the village nearby and meet locals. 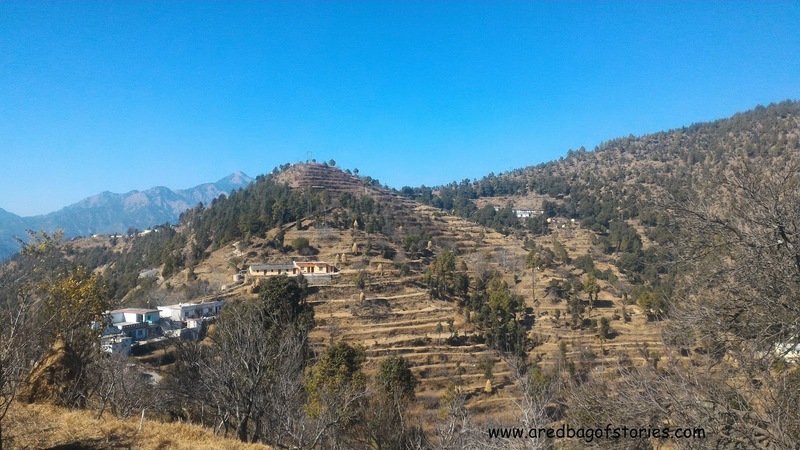 You could visit Chamba that is 5 kilometers before Kanatal. 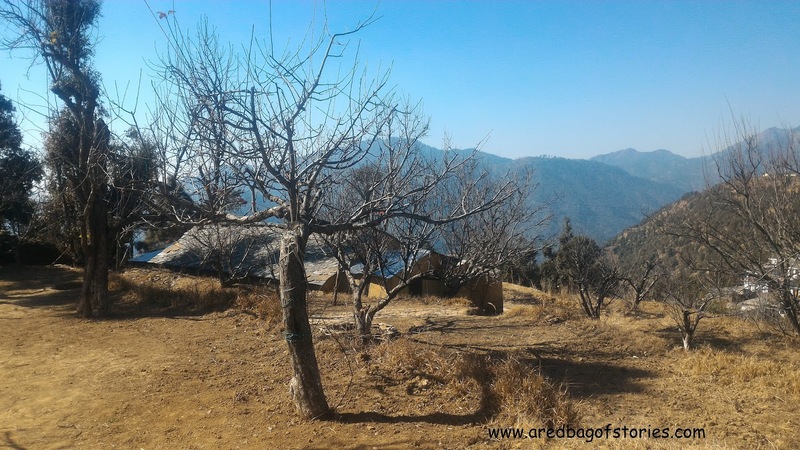 There is the man-made wonder of Tehri Dam that you could definitely consider visiting. 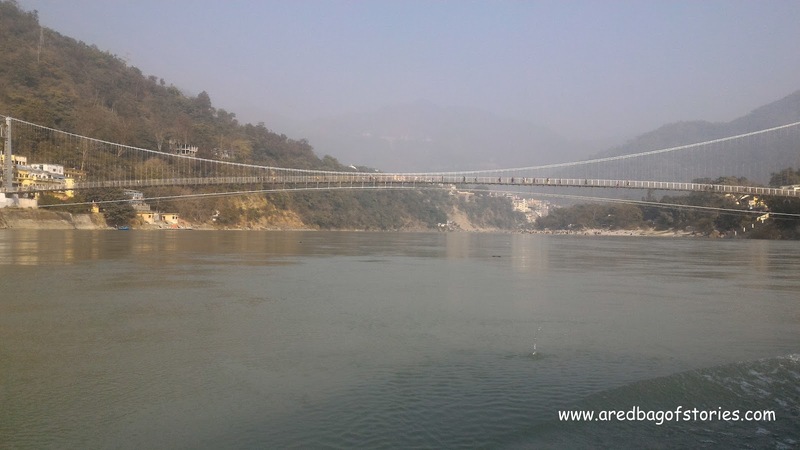 On return, we got dropped at Rishikesh a couple of hours before the bus time. So we got in the boat at one end of Ganga river and got down at the other end. Checked out a yoga institute, had super fresh sugarcane juice, tasted an interesting local fruit – Ramphal, had lunch, looked around some shops, breathed in the cool Rishikesh vibe (trust me, it's very very different), got back in the boat for the ride to the other side and got to the bus stand just in time for our bus. A Delhi winter afternoon when sun is shining brightly and it is a weekend when you do not want to get out of your pajamas, it was supposed to be just that kind of a weekend. Add rajma chawal, binge watching of Homeland and it looked just perfect. However, a bunch of friends had been making a mammoth task of bringing us all together and that day happened to be the one when all of us were available. 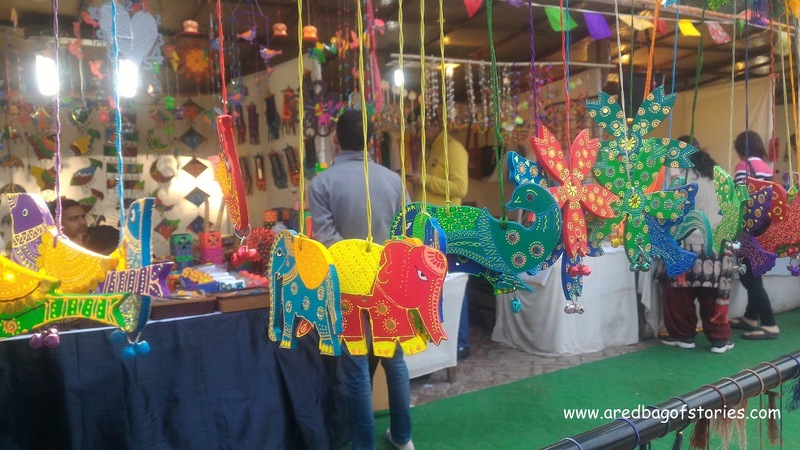 After debating, discussing, dissing and suggesting many a options till that very morning, we zeroed in on Dilli Haat at INA simply because it was a bright, sunny day! Well, do we need any more motivation than bright dhoop on a cold January afternoon? 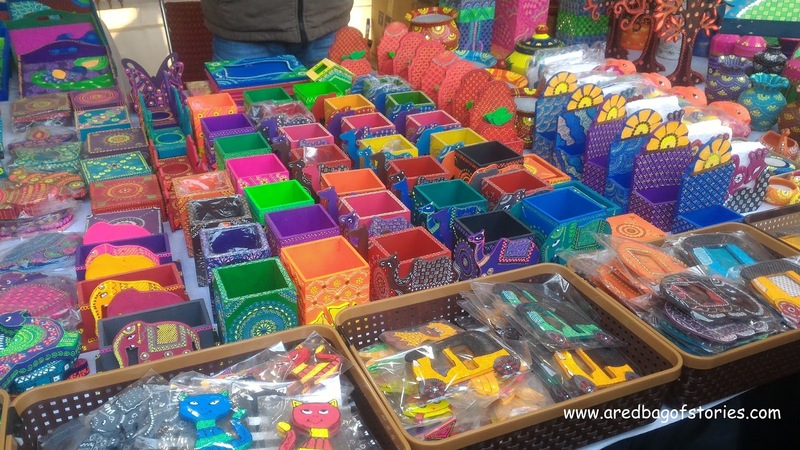 It was my second visit to Dilli Haat, the first being 6 years ago! So, naturally I was pretty kicked about it. But my sole objective was to dip into fruit beer and momos. That’s what winters are about, no? 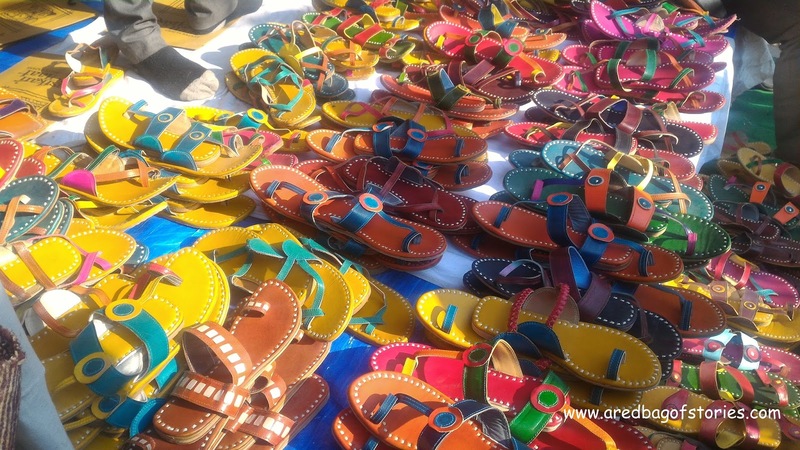 So, momos and fruit beer did happen but what was so interesting was the riot of colors splashed all across the haat, from pottery to flowers to rugs, from sarees to dupattas to jewellery. The warm, bright colors could captivate even the most dull souls, I reckon. 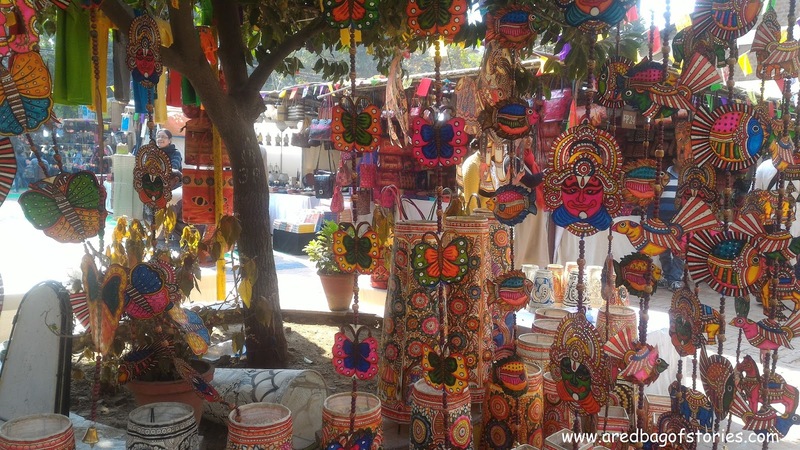 A visit to Dilli Haat is a must if you love art, nature, handicrafts, handmade pieces, intricate work and rustic environment. That stuff from all over the country can be found under one roof is well known but that stuff is so unique and cool that you would have to try hard to not shop all that your heart desires. The love of labour that goes in to each piece will make you realize the worth it is pegged at. 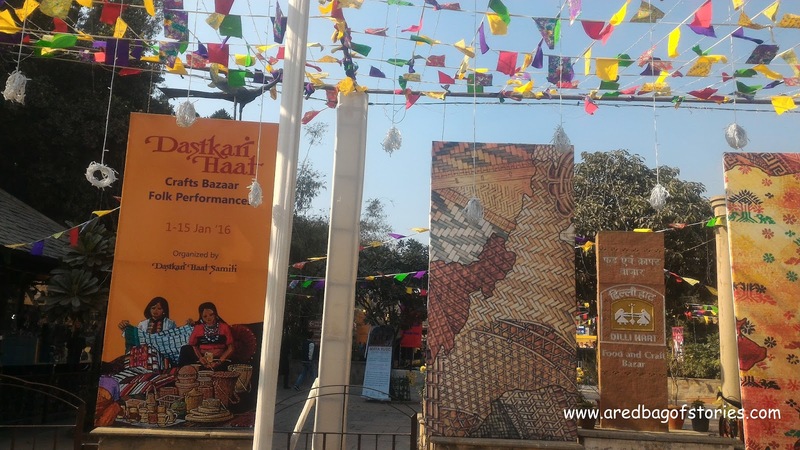 This weekend also happened to be the one when Delhi Literature Festival was on here. In the fag end of the evening, we caught up a rather animated session with an eclectic panel of speakers. 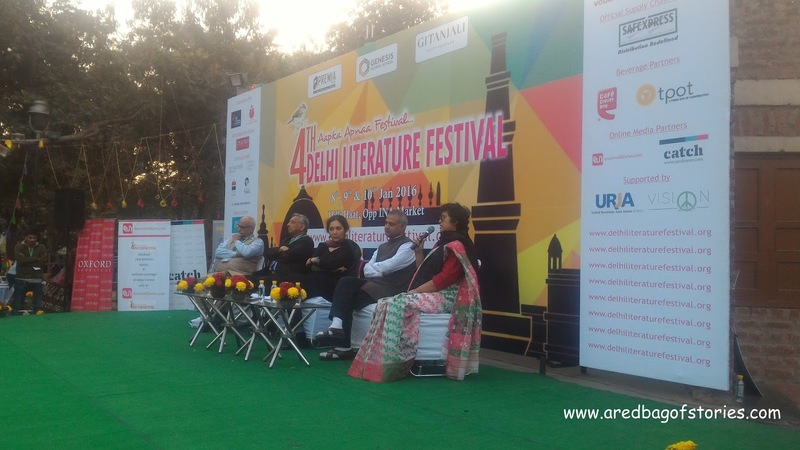 Taslima Nasreen, Sudheendra Kulkarni, Mani Shankar Aiyar and Somnath Bharti were exchanging mics, taking questions from an intelligent crowd. Intolerant India was the dominant theme of the session. 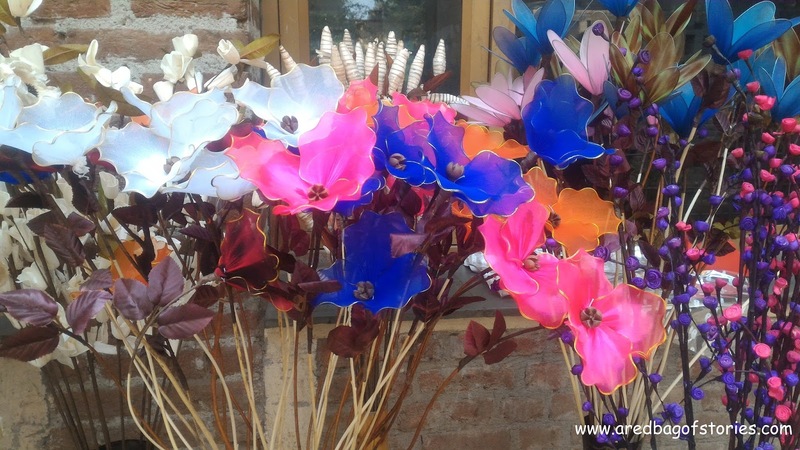 Easily accessible via Delhi Metro, you get down at INA metro station which is just 2 minutes away. An entry ticket of Rs. 20 is the most nominal and opens up a colorful kaleidoscope in front of you once you enter. Believe me, winter is the best time to enjoy this place to the fullest without feeling the need to grab a water bottle every 5 minutes or gasping for shade every 15. You can walk, explore, eat at each state food stall (well, we tend to eat more in winter, right?) 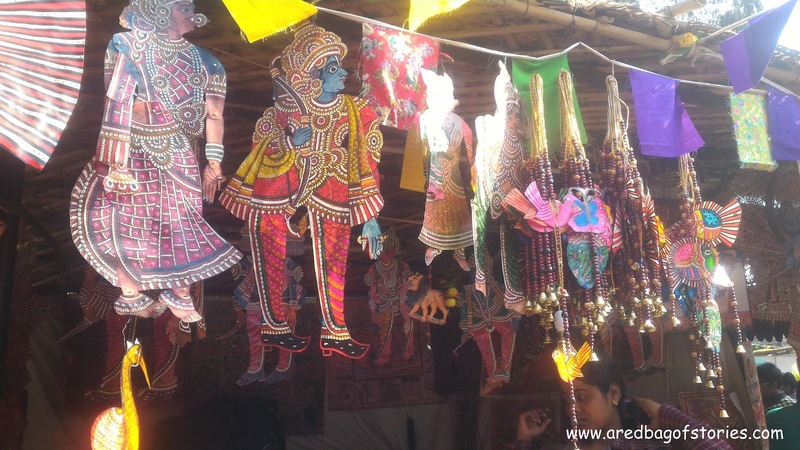 all the while soaking your eyes in the colorful wares and packing your shopping bags. And the pretty fairylights were already up at the main gate by the time we decided to wrap up the day. What a day!